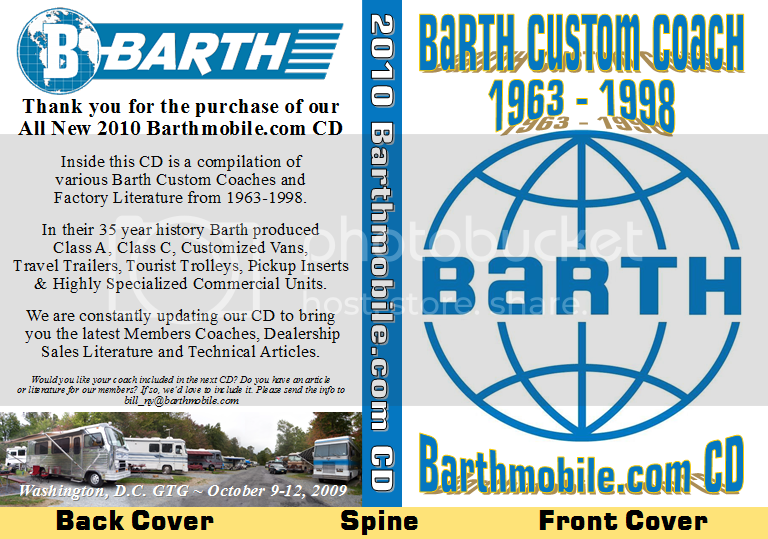 I am pleased to announce that we have updated our Barthmobile.com CD. The All New Barthmobile.com CD has been redesigned. There is over 3.91GB of Barth related items. 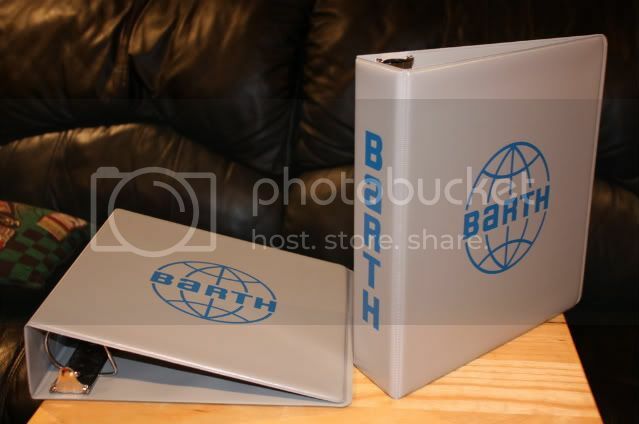 There are pictures of Barth coaches, files, tech articles, the data tag project and original Barth Sales Brochures. Because of its size (4.09 GB+) everything is now on a DVD formatted for data. It is for use in your computer and will not play in a DVD Player. In comparison, the former CD was last updated in 2007 and was around 400mb. As of today, 1/20/09, the current size is exactly 1,097,084,928 bytes. It has 3,708 files and 267 folders for your viewing pleasure. As of today, 10/4/09, the current size is exactly 1,541,916,529 bytes. It has 4,733 files and 327 folders for your viewing pleasure. As of today, 11/29/09, the current size is exactly 1,877,068,160 bytes. It has 5,063 files and 349 folders for your viewing pleasure. As of today, 12/30/09, the current size is exactly 4,208,402,432 bytes. It has 5,906 files and 354 folders for your viewing pleasure. As of today, 4/13/09, the current size is exactly 4,395,442,176 bytes. It has 6,341 files and 376 folders for your viewing pleasure. As of today, 8/13/13, the current size is 6.33 GB (6,798,671,055 bytes) It has 8,817 files and 479 folders for your viewing pleasure. Each Compact Disc is custom made when ordered. It will be dated with an image of your coach placed on the Disc. If I don't have your image, you can supply me with one or I will use a stock photo of my choosing. The cost for this expanded Disc is still $25.00 which includes shipping. Money raised is used for the Barthmobile.com Website or related expenses. I accept PayPal, Checks and Money Orders. The PayPal link is located on the FRONT PAGE. If you prefer to mail a check or money order, the address is. Please make check payable to Bill Napolitano. An update: I've had this question asked a few times so I thought I would repeat it here. Hi Bill, should the cover say Barthmobile DVD vice Barthmobile CD ?? A DVD is a Digital Video Disc. A CD Is a generic term for a Compact Disc. I can make a DVD on a CD Disc and call that a DVD. I can also take a DVD Disc and place text and images and call that a CD. It's really more about the storage capacity of the disc. I could sell 2 CDs or one DVD. Because the object is to make it compact, I opted to use a single "DVD type" Disc that I formatted for the computer as Pictures, PDFs and Text Files. This Disc is capable of 4.7GB. A standard CD is only around 700 MB or roughly less than 1/7 in storage size of the 4.7GB Disc. Tease for next month... You're really going to love the next thing that's coming down the pike!!! Is it smaller than a bread box? Can I wear it on my head? Yes it is smaller than a breadbox. And, for the technologically challenged, the CD case can double as a small hat. Heck, for $25 I'll let you hang it on your Christmas Tree or rear view mirror as a decoration. What it comes down to is a way of getting you to part with your hard earned money. 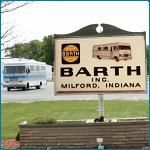 *I applied, and was rejected, for a Federal Bailout (TARP) of Barthmobile.com. I've been told that we are not too big to fail. So, I've been forced to offer some products that people might actually want. Imagine that! This'll keep our site afloat... I hope! Hidden Message > *Humor Only: Site is not in any danger. It's just a little joke. < Highlight. Of course, If you're technologically challenged, then this hidden message means nothing to you. Wait a minute... Are you talking about that "thing that's coming down the pike"? Yeah sure, you can wear it on your head and stick it inside of a breadbox too. Spend 2 million to redecorate your office and you might qualify for TARP! Here it is... the "thing that's coming down the pike". Yes, you can wear it on your head too. BARTH THREE RING BINDERS Follow link for discount pricing on combined "binder and CD purchase". It was first coined as a phrase during the 1904 Worlds Fair in Saint Louis. Among the most memorable features of the 1904 World's Fair was a walkway known as "The Pike". At that time, it was the most extravagant entertainment area ever constructed. Fair goers were so stunned they would say "there's always something new coming down The Pike." Hello, This is my first post and a Barth CD question. I dont have an optical drive on my computer. Is there any way that I could download the Barth CD info online? Thanks! Welcome to the site. There is much good info to be had here. The CD contains many files. There are many photos of Barth coaches, sales brochures, technical documents. I suppose it could be downloaded as individual files, but there are hundreds of them. Much of the technical information, i.e. photos, manuals and documents, is already available here on the site forums. Also try the seach feature. Sorry, I guess this is not really an answer but the best I can think of. Well, I about a year ago sent $40 for a couple of binders and a CD and never heard a word about it. I guess they were out or not going to produce any more but a note would have been nice. I don't mind supporting a site or forum but we should not promise something that is not going to happen. 1993 Breakaway 33'. Cummins 6BTA5.9 with Bosch injection. Upped to 260 HP or so. Third owner. I am disappointed that he has not responded. Maybe try a PM to remind him. I am disappointed that he has not responded. I did send inquiries to him and got absolutely no replies. It is not a big deal but we should take down the offer & logo if we are not actually able to provide the binders and CDs. Hello all. I have not died. I do a few binders left and I can make up a few cd's if needed. Anyone who is awaiting anything that they feel is owed to them please contact me via pm. All I can say is that what I've been through was pretty damn traumatic for me. That's just it though, what one can shrug off another gets traumatized to the point of inaction. Somethings that once was enjoyable become almost impossible to do. I couldn't even listen to a radio for the longest time. Yeah, for me, it was that bad. I've tried many of times to get back into the groove and it's tough for me. Depression probably, but I'm making headway. So, without going into more detail than that please follow up with me and allow me to get caught up. Sometimes I feel overwhelmed but I believe I can get caught up. Allow me this opportunity to put my toe back in the water over here. Rusty, and the other basement dwellers, had my back while I was getting back on my feet. Thank you guys. Please guys tread lightly, I don't have it in me like I used to. Take all the time you need, and welcome back!